Geneva 16 September 2016: South Africa, home to one quarter of the world’s 400+ shark species, will this month host the triennial meeting of the World Wildlife Conference where strengthened protection for sharks and rays will again be high on the agenda. Delegates from over 180 countries attending the meeting – also known as CITES #CoP17 – will receive updates on actions taken following CoP16 in Bangkok, where five shark species, namely the oceanic white tip, porbeagle and three species of hammerhead, and all manta rays were given protection under CITES Appendix II, with trade in these species now being regulated to prevent over-exploitation. Globally, sharks continue to be viewed by some as feared predators, yet the survival of many species of sharks is threatened by human activity including from overfishing, over-consumption of their meat, fins and cartilage and the destruction of their habitats. Sharks play a critical role in maintaining the health and diversity of wider aquatic ecosystems and are particularly vulnerable to overexploitation owing to their late maturity, longevity and low rates of productivity. Since 2013, CITES, with generous extra-budgetary funding from the European Union, has partnered with international organizations, in particular the FAO and Regional Fisheries Management Organisations and Bodies (RFMOs and RFBs), to facilitate the implementation of the added protection measures, working particularly with developing countries. These new measures have presented both challenges and opportunities for countries in ensuring the legality, sustainability and traceability of international trade in CITES-listed sharks that are exploited commercially and traded internationally. Identifying and conducting a capacity needs assessment for 34 key countries in Africa, Asia and Latin America and the Caribbean for the implementation of the listings. Prioritising regional capacity building activities to maximize reach, including through workshops, surveys and face-to-face discussions. Implementing, in collaboration with FAO, regional fishery bodies and other partners, a range of demonstration activities across identified capacity needs that are scalable and can inform future capacity building support. 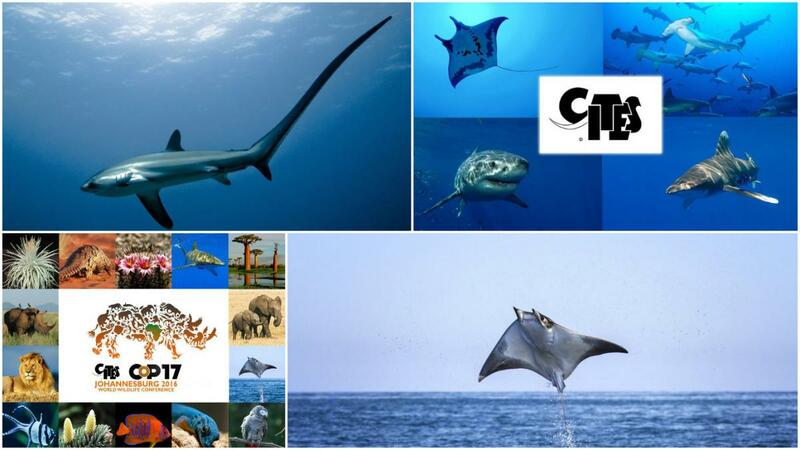 Sharing information and experience via a dedicated web portal on the CITES website. Developing training and awareness-raising materials. In addition, software has been developed for port inspectors, custom agents and fish traders to recognize shark species from a picture of the fin. iSHarkFin was the result of a collaboration between the FAO the University of Vigo and CITES, with financial support from the Government of Japan and the European Union (through the CITES project). There are currently ten species of sharks and rays listed under CITES Appendix II, including the Basking shark, Great White Shark and Whale Shark, as well as the five shark and two manta species added to CITES Appendix II at CoP16. Seven species of Sawfishes fall under Appendix I, which includes species threatened with extinction. Commercial trade in specimens of these species is permitted only in exceptional circumstances. These three proposals have been assessed by the FAO Expert Panel Advisory Panel and by the CITES Secretariat. The 182 Parties to CITES meeting at #CoP17 as a sovereign body will consider all of the information presented to it and decide on whether to accept or reject these proposals. If there is no consensus on any proposal, then the matter will go to a vote with a 2/3 majority vote required for any proposal to be accepted.